Welcome to the May/June edition of Australian Wildlife Secrets. This issue is our twelfth to date and it marks the end of our second year! And we are excited that this is also our first direct-to-digital edition — our early birthday present to you. The digital edition is available for computers, tablet devices such as the iPad, and smart phones, so you can read our fabulous wildlife articles anywhere, anytime! The digital version is fantastic value and can be downloaded either from the Apple iTunes store, if you are an iPhone/iPad user, or from ilovemagazines.com.au if you would like to enjoy the magazine across all devices, including PC and iPad. Our print edition is still, of course, conveniently delivered direct to your door if you are a subscriber and available at all good newsagents. And speaking of subscriptions, we have a brand new competition only for our print/digital subscribers. For your chance to join a fantastic seven-day expedition in Northern Queensland, working alongside the scientists from EarthWatch, all you need to be is a subscriber (new or existing) by 30 June 2013. See page 22 for details on how to enter. 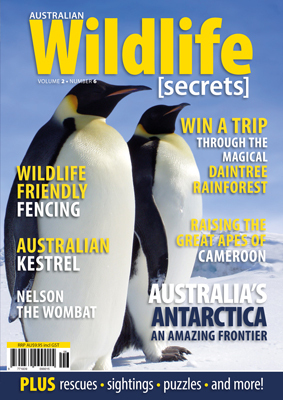 In this issue we look at some of the amazing animals that survive in the harsh, white world of Antarctica. John Cooper takes us inside his incredibly built tower to peek at a family of kestrels. And we bet you haven’t had a chimpanzee climb unexpectedly into your arms — well Fiona Mikowski did and tells about all about her amazing experiences at Ape Action Africa. There’s also some fun Secret Sightings, like romantic Green Tree frogs, plus the O’Mahoneys snap some busy creatures in their Secret Shutterbugs feature. Keep an eye out for the next issue, when we will announce the result of our Reader’s Images competition, which ended on 30 May. We received some truly special photos from our readers all around the country. And don’t forget to check us out online at www.facebook.com/wildlifesecrets to find out what’s happening in the wildlife world and provide feedback on our magazine. We love hearing from you. This is a revealing look at the amazing wildlife that survives and breeds in the white wilderness of Antarctica. These close-up views of a few of this continent’s enigmatic species are brilliantly captured in images taken by Timothy New and others from the Australian Antarctica Division. Also known as the Nankeen Kestrel, John Cooper was taken aback when he spied an active nest of young chicks. Up with his hide and there they were, growing fast, before his camera’s eye. What a rare treat. What do you do when a chimpanzee climbs unexpectedly into your arms? Fiona Mikowski found out when she volunteered at Ape Action Africa to ‘babysit’ young rescued apes being taught how to live in their natural habitat. It was a life-changing experience. What’s Bowerbird? Yes, it’s the name of an iconic Australia bird, but it’s also the name of an incredible social science website creating a comprehensive picture of our biodiversity. We talk to Dr Ken Walker at Museum Victoria to learn all about how you can get involved. ‘Brawk brawk’ was the sound Steve Cook was listening for when he headed out into the balmy north tropical night in search of the romancing Green Tree Frog. James Peake finds an army of Spider Crabs trudging in formation across Port Phillip Bay, ready to shrug off their armour. What a job! When Bernice and Mark O’Mahoney head out with their trusty camera they just don’t know what they’ll find. This time they stumble upon a Short-beaked Echidna nosing into the leaf litter, Musk lorikeets setting up a nest hollow and a foraging Blue-face Honeyeater. Life is busy in the wild. When Nelson the wombat wandered off into the native forest after being rehabilitated, Manfred Zabinskas thought he’d never see him again. But he’s back, and he needs help, and he knows just where to get it. Do you know which fences can fatally harm wildlife and which ones are wildlife friendly? Tanya Loos does, and she’ll tell how to make sure your borders are safe for animal crossings.